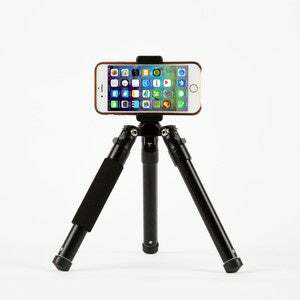 A versatile mini-tripod for smartphones and GoPro cameras that’s small enough to take with you almost everywhere. Going up? 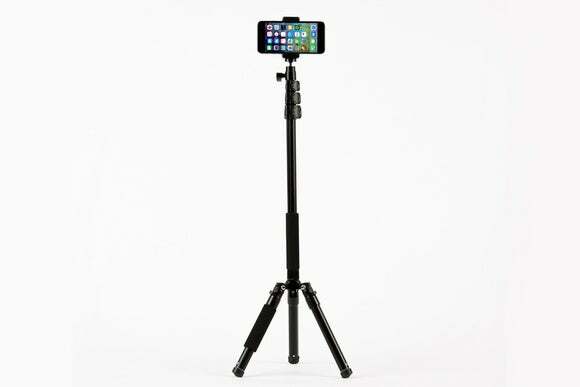 As a tripod, The MonoShot extends from a mere 17 inches to nearly six feet tall in just seconds. 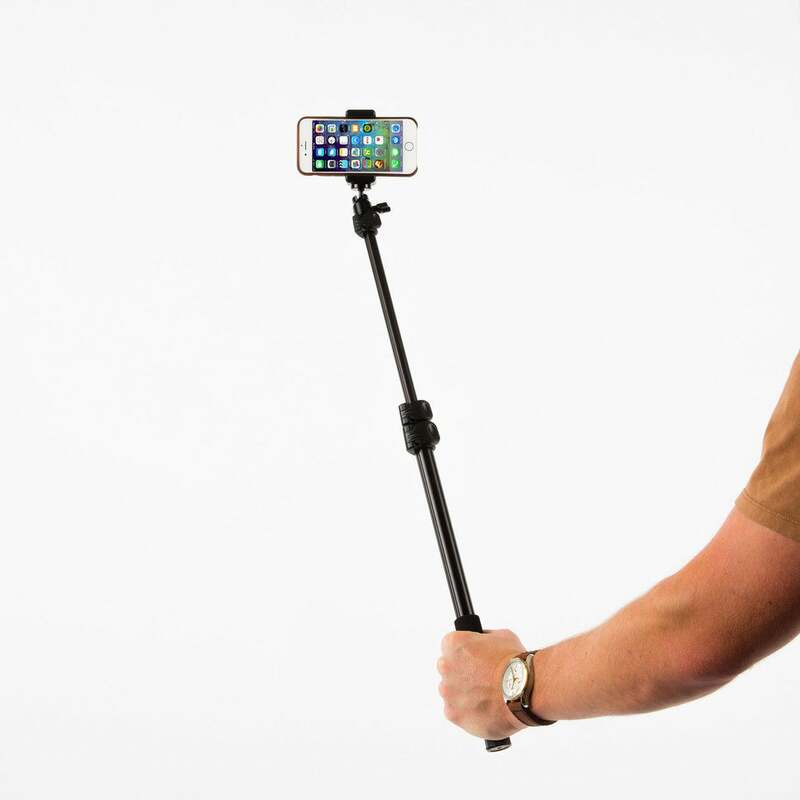 Love ‘em or hate ‘em, selfie sticks are here to stay. And why not; they’re lightweight, convenient, and get the job done in a pinch. But for those who prefer more versatility and less social stigma from their smartphone camera accessories, there’s a new kid on the block capable of handling selfies and a whole lot more. 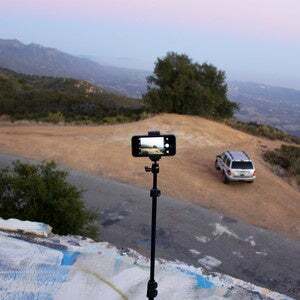 The MonoShot ($59) is a small modular tripod designed for smartphones and smaller cameras like the GoPro. Featuring an attractive matte black finish and constructed of durable, aircraft-grade anodized aluminum, The MonoShot is impressively light at less than 19 ounces with the included spring-loaded universal mount attached, which holds smartphones up to 5.7 inches wide. I had no problem using it with my iPhone 6s Plus while still in the case. When used as a conventional tripod with all three sections extended, The MonoShot ascends to nearly six feet tall, yet collapses to a mere 17 inches when stored. The main body unscrews from the base, allowing the legs to be used independently as a mini-stand for tabletop shooting where panning or tilting isn’t required. The eight-inch legs lock in two positions, but can be telescoped up to five additional inches and held firmly in place with just a twist. Unscrew the main body of The MonoShot, and you’ve got a handy mini-stand for tabletop shooting. With the main body detached, front-facing camera lovers can use The MonoShot as a selfie stick, thanks to a rubberized grip around the bottom of the shaft. A trio of quick-release clamps and an adjustable, precision die-cast aluminum ball head make it easy to get the right angle. 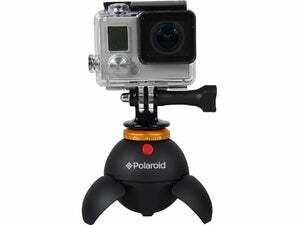 The package includes a rechargeable, keychain-friendly Bluetooth remote for hands-free operation of an iPhone or Android smartphone camera’s shutter and zoom from up to 45 feet away. 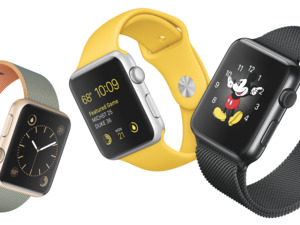 Overall, the build quality is very good considering the affordable price. Even with the main body fully open and extended, it’s plenty sturdy enough for any small camera. I tried The MonoShot as a tripod for my heavier Canon T3i, which was a little wobbly; I wouldn’t recommend it for everyday DSLR use, although the mini-stand works well with most cameras. With the base legs detached, The MonoShot becomes a selfie stick, complete with Bluetooth remote. What impressed me most about The MonoShot is the attention to detail. One of the legs includes a rubber grip like the body of the unit, which makes it easier to hold while extending the telescoping legs. Also included is a removable stainless steel spike attachment, which can be screwed onto the end of the main body for shooting on uneven surfaces like sand, snow, or grass. I have two minor quibbles: A carrying bag is included, but lacks a shoulder strap or accessory pockets. And the included universal mount isn’t ideal for vertical iPhone panoramas. I picked up an inexpensive Square Jellyfish mount instead, which works great for portrait or landscape shooting with The MonoShot. 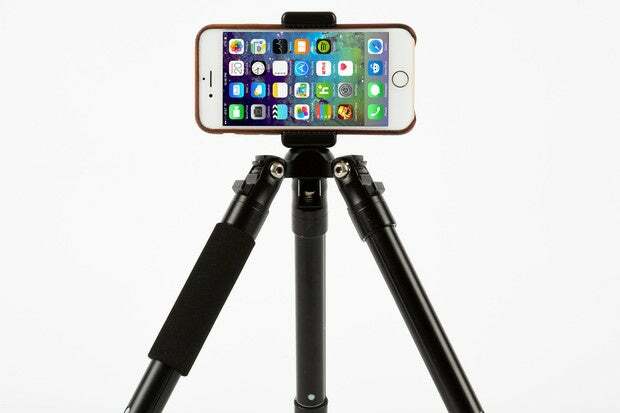 If you regularly shoot photos or videos on an iPhone where a tripod would come in handy, do yourself a favor and buy The MonoShot—it’s like getting several different camera accessories for the price of one. 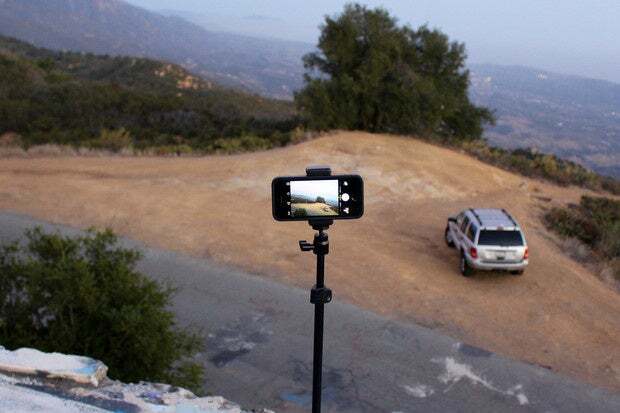 Made from durable aluminum, The MonoShot is a versatile mini-tripod for smartphones and GoPro cameras that’s small enough to take with you almost everywhere.